Lately, I have been lucky enough to assess and to hunt bugs in several implementations of Trusted Execution Environment (TEE) as my day job. As a side project, I began to dig into more TEE implementations, especially on smartphones I had, for personal use or at work and, coincidentally, they come from the same software editor, namely Trustonic , co-founded by ARM, G&D and Gemalto. Being Exynos-based is the only common characteristic between the smartphones I had at hand. Trustonic's TEE, named <t-base, has evolved from Mobicore, G&D's former TEE. To my knowledge, very little public technical information exists on this TEE or its former version. Analyzing it suddenly became way more challenging and more interesting than I initially thought. Let's focus on Samsung Galaxy S6 and investigate further! While identifying trusted applications on the file system was the easiest part of the challenge, looking for the TEE OS on Exynos smartphones I analyzed is comparable to looking for a needle in a haystack. Indeed, the dedicated partition storing the image of the TEE OS that you can find on some smartphones (on Qualcomm based SoC for instance), cannot be found. It must be stored somewhere else, probably in the bootloader itself, and it is the reason why I started to reverse engineer SBOOT. This article is the first of a series narrating my journey to the TEE OS. 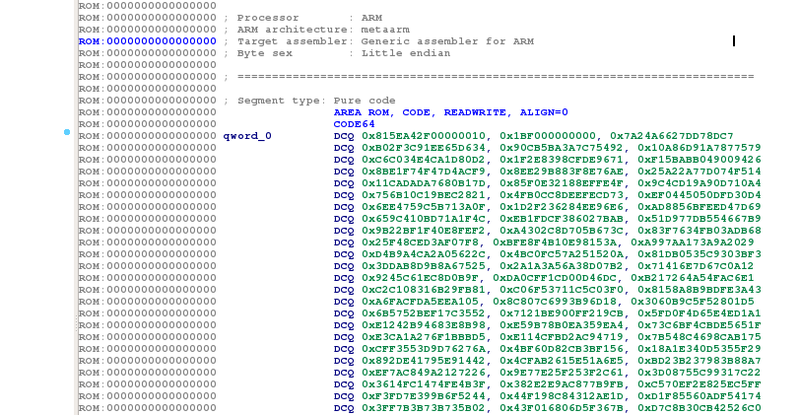 I am going to focus on how to determine Samsung S6 SBOOT's base address and load it in IDA. 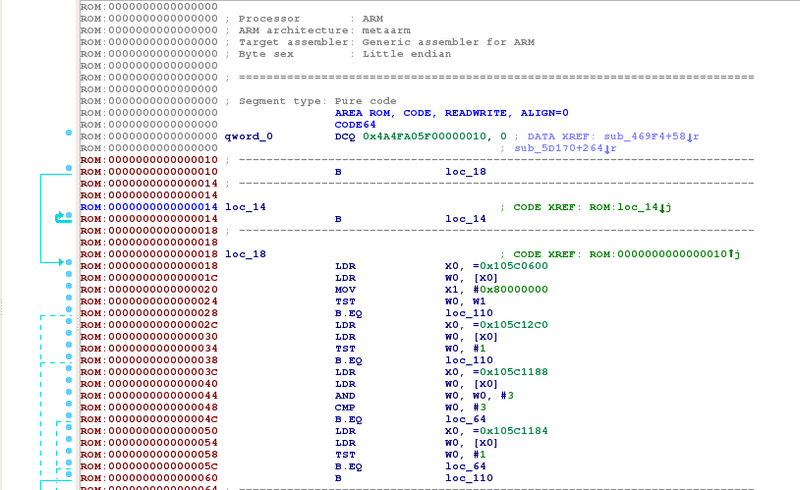 Before launching IDA Pro, let me recall some fundamentals of ARMv8. I'll introduce here several concepts that might be useful to people new to ARMv8 and already used to ARMv7. For a precise and complete documentation, refer to ARMv8 Programmer's Guide . As I am no ARMv8 expert, feel free to add comments if you see any mistake or needed precision. ARMv8 has introduced a new exception model by defining the concept of exception levels. An exception level determines the privilege level (PL0 to PL3) at which software components run and processor modes (non-secure and secure) to run it. Execution at ELn corresponds to privilege PLn and, the greater the n is, the more privileges an execution level has. The type of exception (SError, FIQ, IRQ or Synchronous). If the exception is being taken at the same exception level, the stack pointer to be used (SP0 or SPx). If the exception is being taken at a lower exception level, the execution state of the next lower level (AArch64 or AArch32). A software component running at a specific level can interact with software running at the underlying exception levels with dedicated instructions. For instance, a user-mode process (EL0) does a system call handled by the kernel (EL1) by issuing Supervisor Calls (SVC), the kernel can interact with an hypervisor (EL2) with Hypervisor Calls (HVC) or, directly with the secure monitor (EL3) doing Secure Monitor Calls (SMC), etc. These service calls generate synchronous exceptions handled by one of the exception vector table synchronous handlers. Enough architectural insights for this article, I will write more about this in the upcoming articles. Let us try to load SBOOT into IDA Pro and try to reverse engineer it. To the best of my knowledge, SBOOT uses a proprietary format that is not documented. The Samsung Galaxy S6 is powered by 1.5GHz 64-bit octa-core Samsung Exynos 7420 CPU. 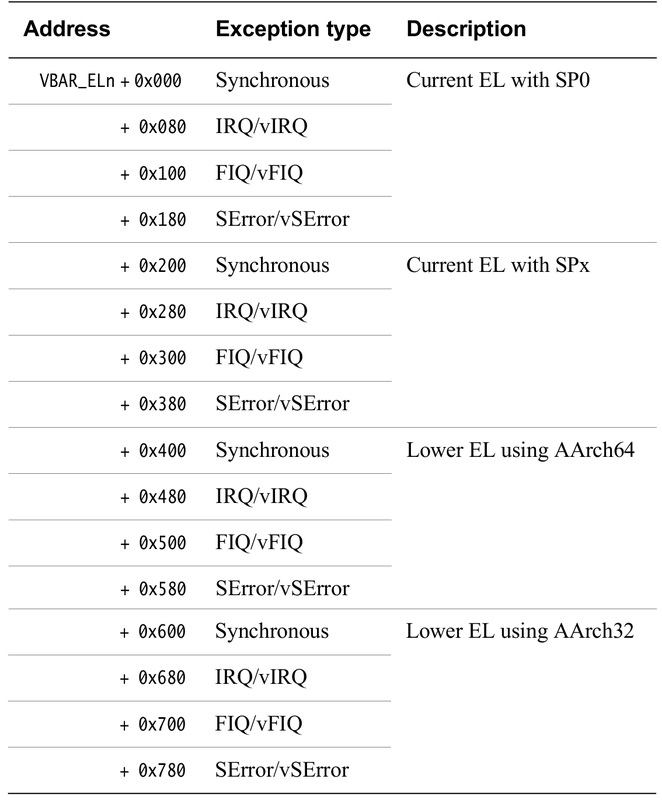 Recall that ARMv8 processors can run applications built for AArch32 and AArch64. Thus, one can try to load SBOOT as a 32-bit or a 64-bit ARM binary. It took me a few days to determine the right base address. As giving you directly the solution is pointless, I first detail all the things I have tried until making the correct assumption which gave me the right base address. As the proverb says, whoever  wrote this: "Give a man a fish and you feed him for a day; teach a man to fish and you feed him for a lifetime". I started by searching for Samsung bootloader and SBOOT related work on several search engines. Unfortunately, results on the subject were scarce and only one reverseengineering.stackexchange.com thread  dating back to March 2015 was relevant. This thread mainly gives us 2 hints. J-Cho had the intuition that the bootloader starts at the file offset 0x3F000 and Just helping suggests that it is actually starting at 0x10. I also analyzed if there were any debug string left on other bootloaders that would give me hints on where SBOOT is generally loaded in memory. No luck :( But I got another lead: some strings in Meizu's SBOOT suggested that U-Boot is used. Even if U-Boot is not used on Samsung Galaxy S6, it was a lead worth exploring and I started to dig further. U-Boot is open-source and supports several Exynos chips. For instance, Exynos 4 and Exynos 5 have been supported for more than 5 years now. Support for the Exynos 7 has not fully landed on the mainline yet but, based on their mailing list , some patches exist for the Exynos 7 ESPRESSO development board. I may have missed it, but going through patches for the ESPRESSO development board did not bear fruits :( I tried multiple known base addresses from Exynos 4 to Exynos 7 boards without succeeding. It was time to try another angle. If you are used to reverse engineering ARM assembly, you must have noticed the massive use of literal pools to hold certain constant values that are to be loaded into registers. This property may help us to find approximately where SBOOT is loaded, especially when a branch destination address is loaded from a literal pool. 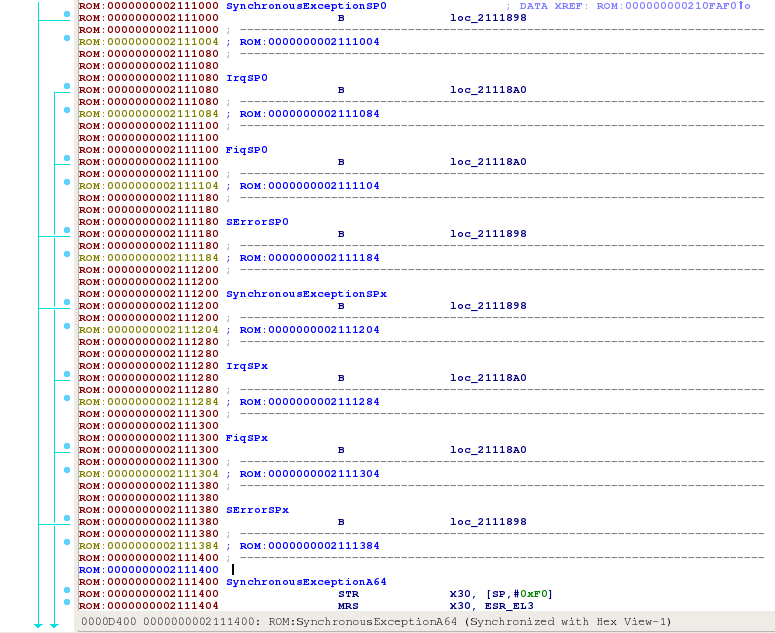 I searched all the branching instructions marked with errors in operands (highlighted in red) by IDA Pro. As the code of a bootloader is self-contained, I can safely assume that most of the branches destination address must target code in the bootloader itself. With this assumption, I could approximate the bootloader's base address. Branching instructions BR (Branch to register) are unconditional and suggest that it will not return. The operand value for both branches is the same (0x2104010) and, it is located very early in the bootloader. The last byte is 0x10 which is exactly the offset where the code of the bootloader seems to begin. Now that I may have the potential base address, I continued reverse engineering SBOOT hoping that there were no anomalies in the code flow. As I wanted to find the TEE OS, I started searching for pieces of code executed in the secure monitor. A rather simple technique to find the secure monitor consists in looking for instructions that set or read registers that can only be accessed from the secure monitor. As previously mentioned, the secure monitor runs in EL3. VBAR_EL3 is rather a good candidate to find EL3 code as it holds the base address of the EL3 exception vector table and leads to SMC handlers. These anomalies would suggest that 0x2104000 is not the right base address yet. Let us try something else. Samsung Galaxy S6 SBOOT is partly based on ARM Trusted Firmware . ARM Trusted Firmware is open-source and provides a reference implementation of secure world software for ARMv8-A, including a Secure Monitor executing at Exception Level 3 (EL3). The assembly code corresponding to the secure monitor is exactly the same as the one in ARM Trusted Firmware. This is good news because it will buy me some time and save me reverse engineering efforts. Victory! Samsung Galaxy S6 SBOOT's base address is 0x02102000. Reloading the binary into IDA Pro with this base address seems to correct all the oddities in the disassembled code I have seen so far. We are sure to have the right one now! The reverse engineering process is like solving a puzzle. One tries to understand how a piece of software works by putting back together bits of information. Thus, the more information you have, the easier the puzzle solving is. Here are some tips that helped me before and after finding the right base address. 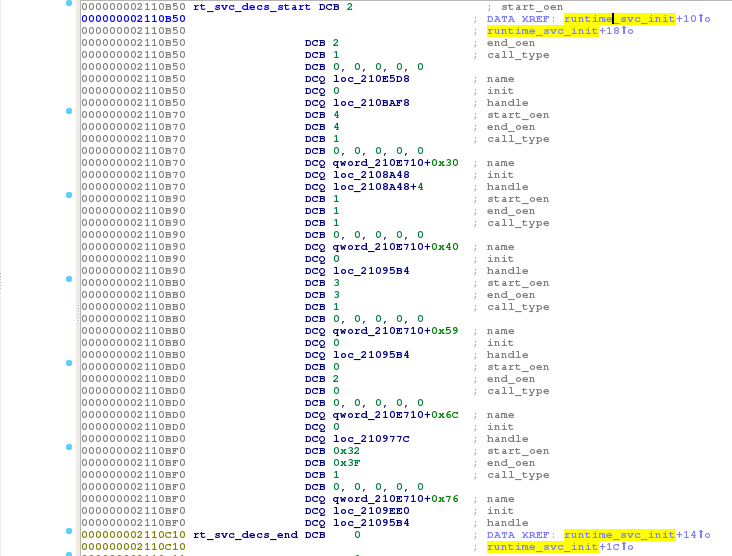 mov_x29_sp = "fd 03 00 91"
Astute readers will probably notice that MOVE isn't a valid ARM64 instruction. MOVE is simply a marker to tell the reverse engineer that current instructions have been simplified and substituted by this instruction. As previously mentioned, SBOOT is partly based on ARM Trusted Firmware . Since the source code is available, one can save a lot of reverse engineering efforts by browsing the source code, recompiling it and do binary diffing (or signature matching) in order to recover as much symbols as possible. They sometimes have complementary results. In this article, I described how to determine SBOOT's base address for the Samsung Galaxy S6 and how to load it into IDA Pro. The method described here should be applicable to other Samsung's smartphones and probably to other manufacturers' products using an Exynos SoC. The journey to the TEE OS will continue in the next article. Stay tuned folks! jb for all the discussions we had and for his help. André "sh4ka" Moulu for encouraging me to write this series of articles, describing my journey to the TEE OS. Quarkslab colleagues for their feedback on this article.